My name is Deb Powers (AKA DJ because there are just too many Debs out there) and I live in Maryland, USA. I’m originally from New York state near the Canadian border. I am happily married for 32 years and have one son. We also have a cat named Thomas. I’ve been stitching half a century (as my husband would so happily point out). Both my Grandmothers were needleworkers, one working in a dress factory who could tat, crochet, knit and quilt. The other owned a needlework business and could crochet, knit, quilt, and various different types of stitching (Swedish darning, hairpin lace, etc). She sold her creations from her home. 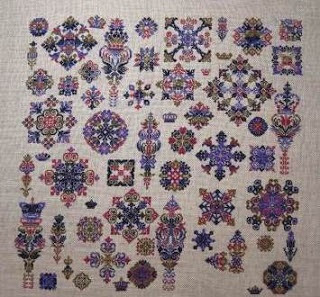 I completed my first sampler which was a stamped cross stitch when I was 7. I went on to learn embroidery by stitching on stamped dresser scarves. Both of them lived far away so when we went to visit them they would take the time to teach me to stitch. I’ve been blogging since February 2009. 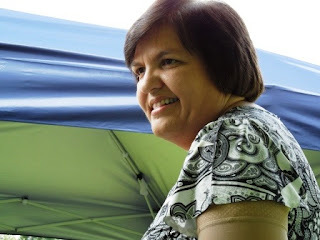 I joined a few Yahoo groups back then and a few of the ladies encouraged me to begin blogging to show my work. 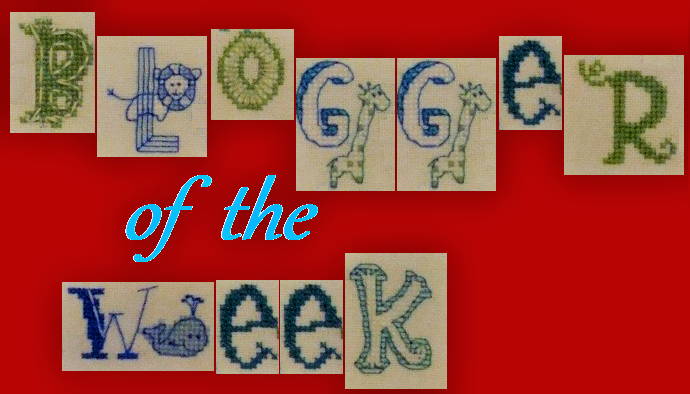 I have always loved writing and needlework, so I thought it would be a fun way to connect with other stitchers. I like to laugh and share puns and bad jokes. Years before I started my blog, I had an email address that began with tickled pink, so that’s where my blog title came from. Oh my goodness...I guess you could say a little of most of the above. When I first started stitching I was a OAAT. Then I married a military guy and we began moving around. I would lose my stitching (more times than I can count) so would start something else, then later would find the first one so I became a serial starter. Then we would move to another state/country and I would find different styles of stitching so I became very eclectic as I would become enamoured with the local style. I have Southwest designs, French designs, Quakers, large Dimensions kits, Oriental designs, I tend to buy patterns that speak to me. I’ve learned recently to be more selective. I will look at something for several months before I decide to buy. I wish I were highly organised, but truth be told, I’m totally random in how I stitch. With so many started at the moment, I decide on the day which one I will stitch though I have a list I would like to accomplish this year. I tend to go in phases. For a while I enjoyed stitching Quakers and Stickideen von der Wiehenburg was my favorite designer. I love Plum Street Samplers, I think I’m drawn to her color combinations and the Christian themes she sometimes uses. 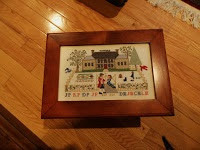 I enjoy Little House Needleworks because of her Christian themes as well. They are usually fun and quick stitches, but I like more involved pieces too, ones that look like paintings when you are finished. My Big Toe is also a favorite. 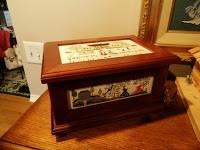 It’s hard to pick just one, but I guess I would have to say the needlework casket I finished a short time ago. I had to restart one of the panels because the count was too small. I learned a lot of new stitches which is always a challenge for me, and it was something I hoped to stitch and finish within a year. I added a few things and personalized it somewhat to represent our families. When I was little my Grandmother had a crazy quilt. 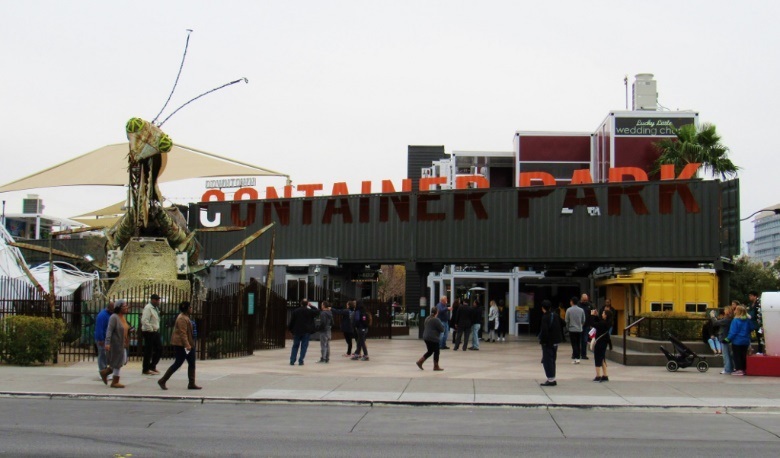 She started by using unusual fabrics she would find here and there. Bits of dresses that were worn out, leftover fabric after she reupholstered a piece of furniture, etc. There was all kinds of beautiful fabric, all different shapes, and lovely different stitches in different threads holding it all together. I don’t know what ever happened to that quilt, but I would study it for hours looking at all the lovely stitching. I would love to make something like that of my own. I’m sure there were many memories stitching into that quilt. I like to learn new stitches, I think it would be a labor of love. I have a HUGE box of finished-but-not-fully-finished pieces. Some are small, some are large, some are even too large to frame! I used to work in a frame shop and at one time had all my extras framed, but I no longer work there, so things get placed in this box. Special ones I finish I will fully finish them by either framing, or I have a couple of techniques I use. I can make them into a hanging ornament, or a flat fold. I’ve made biscornus, they are fun to finish. I’ve also made stand up cubes. The small pieces I tend to place in my china cabinet. The rest I hang on walls and rotate with the seasons. Since I was a framer, my favorite way to finish is framing, but it is expensive!! I stitched one a while back, that hasn’t been fully finished. I think the verse on it represents me the most. It’s called Noble, Right, Pure by Abbey Rose Designs. Stitching has always had a special meaning for me. It’s a way to be creative and express feelings and keep memories, but it’s also a way to leave a legacy. I hope that future generations will enjoy my creations as much as I cherish those that were passed on to me. I also hope that the gifts I have given over the years will express to those I love that they were thought of, and prayed for and that they hold a special place in my heart. Hello DJ is has been lovely to read about you.Your needlework casket is gorgeous.I shall hop over to your blog to enjoy more of your stitching. Lovely to learn more about you DJ. I remember watching your casket come together, it's beautiful. I love the last sampler too. This has been a pleasure to meet a new stitcher to me. Your large Quaker piece that has yet to be finished is awesome!! Great to meet you DJ. Good luck finishing your large Quaker piece. I really like your stitching on the box, it is a great way to finish and pairs so well with the wood sides. Nice to learn more about you DJ. Another fantastic post. Nice to meet you DJ. So interesting to read about. How nice to meet you, DJ! 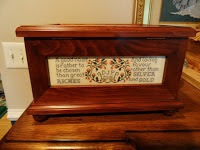 Your needlework casket it beautiful and you are to be congratulated on having it completely finished and on display. The Quaker SAL is delightful and the colors are gorgeous ... I hate to think about your having to frog over-one stitching but am sure you've already explored options of adjusting motifs so everything fits. Maybe you could use the 10-a-day idea and take out ten stitches at a time? Lovely to learn more about you, DJ. I always enjoy reading your blog. Thank you for sharing all about your love of stitching. So nice to read all about you. 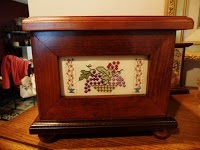 The needlework casket is such a lovely creation; I've never seen one before. 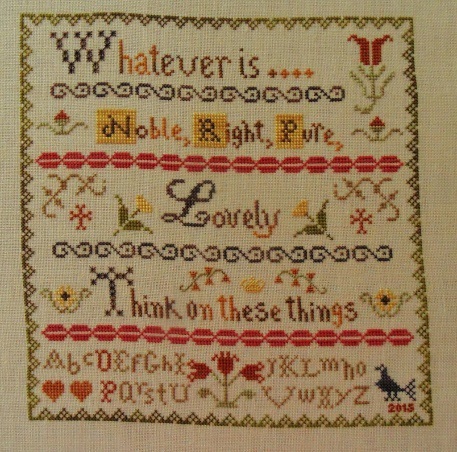 I am presently stitching the Cornwall Cottage sampler with half Quaker motifs and enjoying it. But I do hate when I make a mistake which always happens at some point. Life, I guess! Happy Stitching! So wonderful to read all about you DJ! I do love that box you made! Wow! Hi Deb!The casket is amazing!AriadnefromGreece! Nice to meet you DJ, a beautiful needlework casket you stitched. Lucky me, I've seen it in person! The pictures are lovely, but the real thing is just, WOW! Us bag ladies need to stick together! So nice to read about you. 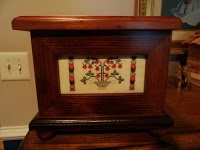 Your needlework casket is just awesome, a great piece. Wow, DJ, you come by your stitching honestly. I think it's safe to say that stitching is in your blood!